Digital technology is ubiquitous in American workplaces. Computers have colonized substantial portions of work activities from organizing the shipment of washing machines to assisting surgeons in operating rooms. There is a drumbeat of commentary about the impact digital tools has had. Some see these tools as increasing productivity and offering more flexibility for America’s workforce; others say they decrease productivity and pressure workers to be constantly connected to their workplace. Over the past 15 years, the Pew Research Center has asked internet users a variety of questions about the role of the internet in their work lives and the impact the internet, email, mobile phones and other tools have had in their workplaces. This report updates that work and focuses on these questions: How important are the internet, email and cell phones to the work people do and how do these tools impact things like productivity and time spent working? 53% of internet users are employed full-time or part-time, in positions ranging from executive to business owner to skilled and semi-skilled workers. The 535 working adults forming the basis of this report are drawn from a panel survey of 1,066 internet users.2 In that survey, 53% of respondents reported being employed either full-time (42%) or part-time (11%). Demographically, these working adults skew slightly male and are more likely to be in the 30-59 age range when compared with adults who are not working. Overall, they have higher levels of educational attainment and household incomes than their non-working counterparts. “Office-Based” (n=326) includes what have traditionally been referred to as “white collar” jobs, including professionals, executives, managers, business owners, and clerical workers. Because these occupations are historically office-based positions, they provide insight into how office-based work has been impacted by the internet and other digital tools. “Non-Office-Based” (n=130) includes occupations that have traditionally been labeled “blue collar” and include service workers, skilled trades, and semi-skilled workers. These positions are generally based in non-office settings and provide some idea of how the internet and digital tools are impacting this sector of the workforce. While these are broad occupational categories, they provide analytical insights that might not be apparent when looking at “workers” as a whole. Given the relatively small sample size of 535 workers, it is not possible to look at each occupational category on its own. Demographically, these two groups differ in key ways. Non-Office-Based workers include a higher percentage of men than women. Office-Based workers, in contrast, skew more female, include a much higher percentage of college graduates and report higher annual household incomes overall. For American workers who use the internet, email and the internet top the list of tech tools needed to do their jobs, while landline phones rate higher in importance than mobile phones. Six in ten (61%) American workers who use the internet say email is “very important” for doing their job, and 54% say the same about the internet. Far fewer workers describe landline phones (35%) or cell phones and smartphones (24%) as “very important.” Just 4% say social networking sites like Twitter, Facebook or LinkedIn are “very important” to their work. The high importance of email in the workplace reported in the current survey is not surprising. As early as 2002, Pew Research Internet surveys showed that 61% of American workers were using email at work. In 2008, we reported that 62% of working American adults were “networked workers,” meaning they used the internet or email in the workplace. This high standing for email has not changed since Pew Research began studying technology in the workplace. Email’s vital role has withstood major changes in other communications channels such as social media, texting, and video chatting. Email has also survived potential threats like phishing, hacking and spam and dire warnings by commentators and workplace analysts about lost productivity and email overuse. Perhaps even more surprising is that, despite the proliferation of mobile phones in the U.S., cell and smartphones rate lower than landline phones in terms of their importance to U.S. workers doing their job. One in three workers (35%) say landline phones are “very important” to their work, compared with 24% who say the same about mobile phones. 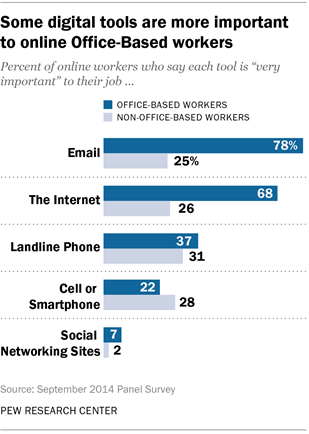 Email and the internet are more important to some sectors of the workforce than others. Those in Office-Based occupations are three times as likely as those in Non-Office-Based occupations to say email is “very important” for doing their job (78% v. 25%). Moreover, 3o% of adults working in Non-Office-Based positions say email is “not at all important” to their jobs. Results for the internet are similar: Office-Based workers are more than twice as likely as Non-Office-Based workers to say the internet is “very important” for doing their job (68% v. 26%), while 32% of the latter group say the internet is “not at all important” to their jobs. In addition to the internet and email, Office-Based workers are more likely than Non-Office -Based workers to say social networking sites are “very important,” though even among Office-Based workers that figure is just 7%. While the two broad occupational groups do not differ significantly in their assessment of the importance of cell phones and smartphones to their work, there are significant differences across several demographic subgroups of workers. For example, men are almost twice as likely as women to say cell and smartphones are “very important” for doing their job (30% v. 17%). Working adults from households with incomes of $50,000 or greater are also more likely than those in lower income households to rate mobile phones as “very important” (28% v. 15%). For those who work away from their home-base workplace, the internet and cell phones are key tools. Among full-time and part-time workers, 21% work outside of their workplace every day or almost every day, and another 13% work outside the office a few times a week. 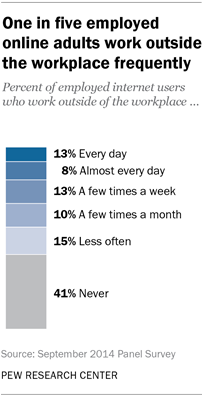 Overall, 41% of workers say they never work outside their workplace. Adults in traditionally Office-Based occupations rely much more heavily on the internet and cell phones when working remotely than those in traditionally Non-Office-Based occupations. Two-thirds of remote workers in Office-Based occupations say the internet and cell phones are “very important” in allowing them to work remotely, compared with 26% of remote workers in other types of occupations. 35% of employed online adults say the internet, email and cell phones have increased the amount of time they spend working. To gauge the perceived impact of the internet, email and cell phones on how people work, survey respondents were asked if these tools increased the amount of time they spend working, allowed them more flexibility in the hours they work, and/or expanded the number of people outside of their own company they communicate with. The latter area is where these digital tools appear to have the greatest impact, with 51% of working adults feeling the internet, email, and cell phones have increased their communication with people outside of their company. Adults employed in traditionally Office-Based occupations feel all of these impacts more than those who work in occupations that are traditionally Non-Office-Based. The Office-Based workers are more than twice as likely as Non-Office-Based workers to say the internet, email and cell phones have given them more flexibility in the hours they work (51% v. 19%) but also that these tools have increased the amount of time spent working (47% v. 18%). Pew Research has asked similar questions of U.S. adults in the past. A 2008 national telephone survey asked employed adults who used the internet, email or cell phones 1) if these technologies increased demands that they work more hours and 2) allowed more flexibility in the hours they worked. At the time, 33% of these adults said that the internet, email and cell phones increased “a lot” or “some” demands that they work more hours. Slightly more working adults at the time, 45%, said these tools had the same level of impact on allowing more flexibility in hours worked. 46% of employed online adults say the internet has made them more productive at work, while just 7% believe it has made them less productive. Overall, 92% of working adults say the internet has not hurt their productivity at work. This includes 46% who say the internet has made them more productive and another 46% who say the internet has had no impact on their productivity. Fewer than one in ten working adults say the internet has made them less productive in the workplace. Adults working in traditionally Office-Based occupations are twice as likely as those in Non-Office- Based occupations to say the internet has increased their productivity (58% v. 23%). However, Office-Based workers are also more likely to say the internet has decreased their productivity (9% v. 3%). In contrast, the vast majority of workers in traditionally Non-Office-Based jobs (74%) say the internet has had no impact on their productivity. 46% of online working adults say their employer blocks certain websites and has rules about what employees can post online—a big uptick since 2006. Among adults employed full-time or part-time, 46% say their employer blocks access to certain websites and the same percentage says their company has rules about what they can say or post online. For both of these items, substantial percentages of respondents were not sure if this is something their employer does; 18% of working adults are not sure if their employer blocks access to any websites, and 27% are not sure if their employer has rules about what employees can say or post online. Asked about promoting their company online, 23% of working internet users say their company encourages employees to do this. More than half (56%) say this is not something their company encourages employees to do. Asked whether their employer blocks access to certain websites and has rules about how employees present themselves online, those employed in traditionally Office-Based occupations are more likely to say this is something their employer does. For all three items—blocked access to websites, rules about employees’ online presentation and encouraging employees to promote the company online—those working in traditionally Non-Office-Based occupations are more likely to say they are not sure if this is the case. 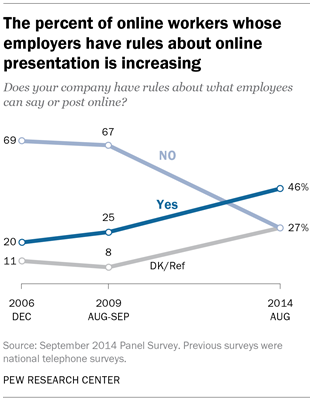 In both 2006 and 2009, Pew Research asked a nationally representative sample of working adults if their company “has policies about how you present yourself on the internet—for example, what you can post on blogs and websites, or what information you can share about yourself online?” Results indicate that over time, more and more employers are implementing these types of policies. In 2006 one in five working adults said their employer had such policies, and in 2008 the figure was one in four. In the current survey, almost half of employed adults work for employers who have policies about what employees say or post online.